The history of Disney animation is vast. 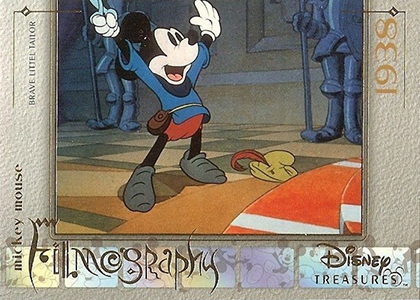 2003 Upper Deck Disney Treasures Series 1 is the first of three releases from the card maker to tackle the films and characters that made Mickey Mouse a global icon and helped launch an empire. The base set has 89 cards. It's like the first part of a character encyclopedia, profiling both major and minor characters from dozens of animated shorts and features. Card fronts have a large character image taking up about two-thirds of the space. A thick name plate runs up the right side. It has their name, the film they're from as classifies everyone as "Heroes" and "Villains." Five small images of Mickey Mouse are also integrated into this area. Backs have a second image and a short write-up. The name plate is repeated. 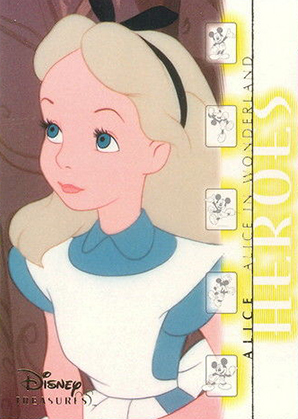 The majority of inserts in 2003 Upper Deck Disney Treasures Series 1 go into more depth in certain areas of Disney history. 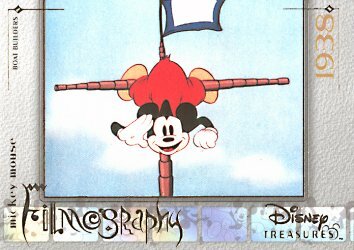 Mickey Mouse Filmography is a 45-card set that highlights the iconic character's short films. 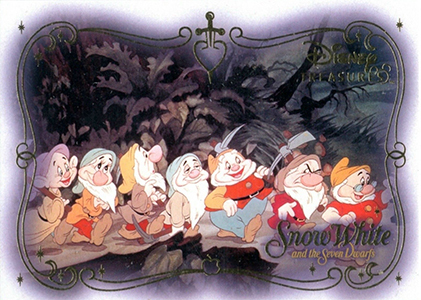 Snow White and the Seven Dwarfs takes ten cards to recap the first animated feature ever made. 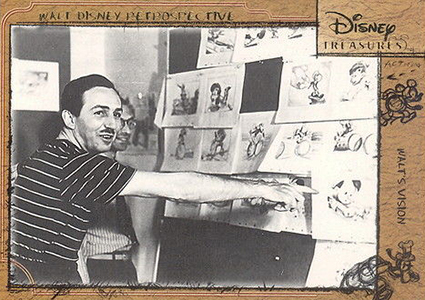 Walt Disney Perspective (ten cards) honors the company's visionary creator. 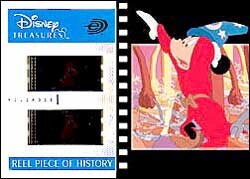 Every box of 2003 Upper Deck Disney Treasures Series 1 comes with a Reel Piece of History card. Each of the ten cards has a pair of frames from a print of the featured film. This leads to lots of variety as no two frames are exactly alike. Sometimes, cards that have key scenes or particular characters can draw a premium. There are a few major chase cards in the product. The first are Sketch Cards. 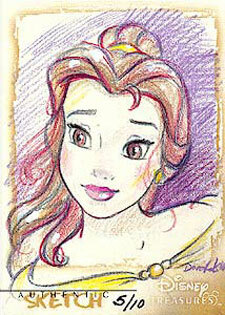 Ten Disney artists each contributed ten cards (100 sketch cards across the entire product run). They're exceptionally rare and command big prices on the rare occasions they surface. Finally, there's a one-of-one Walt Disney Cut Signature. Boxes come with 24 packs of five cards. The set also has retail boxes that have four packs and one of four mini Mickey Mouse bobblehead figures. Disney Treasures Upper Deck Daisy Duck 1937. 10 cards. Inserted 1:24 packs. Each artist did ten cards. 10 cards. Inserted 1:10 packs. 1 card. One copy exists. One included in each four-pack retail box.